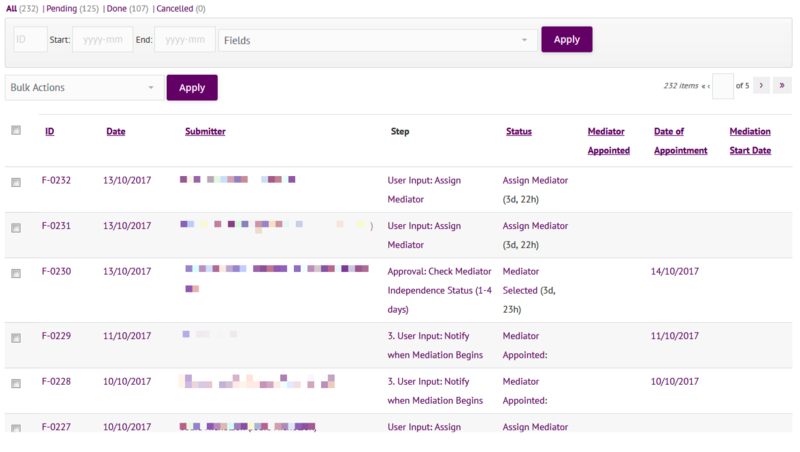 In this case study, we describe how the office of the Mediation Adviser appointed by the Australian Government uses Gravity Flow to automate dispute resolution services. It has enabled them to halve costs, double the number of cases and reduce the entire initiation process from weeks to a few hours. The Office of the Franchising Mediation Adviser (OFMA) assists franchisors and franchisees resolve their disputes under the Franchising Code, without having to go to court. The OFMA maintains a panel of experienced and qualified mediators in each state and on request of either the franchisor or franchisee, the Adviser appoints mediators who can assist the parties in resolving their disputes. The initiation process for mediation requires up to 20 different documents to be collated and shared securely between the mediator, the parties and the Office of the Mediation Adviser (OFMA). Before they started building their system, they knew in advance that they wanted a system that they could apply to mediation processes across a range of industries later on. So the workflow had to be easy to use, easily reusable and easily adapted. The first step was to clarify the process. The following swim-lane diagram shows the entire process from beginning to end and makes it clear who does what and when. Once the process was clear, the workflow was implemented in Gravity Flow with a series of User Input, Notification, Approval, Form Submission and Folder steps. The result is a secure, highly scalable and efficient workflow solution that perfectly fits the needs of the organisation. The mediators access their inbox in their members’ area on the front-end so they can see where each dispute is in the process. Diagram 2: Dispute resolution process – the administrator’s status page. The timeline for each entry shows all the key events in the process so the coordinators can see the history for each case at a glance. They use the Form Connector Extension to make the workflow wait for the submission of report forms. They use the Parent-Child Forms Extension to display the links to the reports from the main dispute details. And they use the Folders Extension to display all the entries at each key step of the process. PDF Documents are generated at each step using custom PDF templates designed by the team at Gravity PDF. Diagram 3 shows the final workflow as it is implemented in Gravity Flow and generated automatically by the Flowchart Extension. Some of the steps were removed for brevity and clarity. The automated workflow enables the initiation process to take just a few hours instead of dragging on for weeks. They’ve been able to double their productivity and to take on more than twice as many disputes which have been lodged in the past year. It’s now much easier for clients to lodge a request, for mediators to notify the status of the mediation and for the OFMA to follow and control the whole process online as it progresses through the various steps. It has enabled a cloud based solution that can be managed from anywhere in Australia allowing for decentralisation of the workflow and workplace. It’s also more reliable, more secure and much more scalable than the previous manual system. The implementation of this first process has demonstrated that Gravity Flow is the perfect solution for this dispute resolution office. The next step is to extend the system and apply it to the mediation and dispute resolution processes for two other industry schemes which the Office also controls; the Horticulture Code and the Oil Code. Because of the greater complexity and diverse geographical nature of the disputes, both of these industry dispute resolution schemes require greater enhancement and additional inputs which Gravity Flow is able to deliver. If you’d like to find out more about how process automation can help make your organisation more efficient, please get in touch.